Thirty years ago in the summer of 1988 Iranian regime under Khomeini committed a crime unprecedented since Second World War. In a few months 30000 political prisoners were executed in Iran. The prisoners were severing their sentences. The order was to exterminate all prisoners still believing in the People’s Mojahedin Organization of Iran (PMOI/MEK). The majority of prisoners were members and supporters of the MEK. The regime saw the MEK as its main rival and enemy. A four members “Death Commission,” as it is famous among Iranian political prisoners oversaw the massacre of 30000 political prisoners in 1988. Ebrahim Raisi and Mostafa Pour-Mohammadi — Justice Minister in Hassan Rouhani’s first cabinet — were two of the four members of the Death Commission who were tasked by then Supreme Leader Khomeini to immediately execute political prisoners. Raisi was a low level cleric at the time and in return for his services was elevated in the rank and files of the mullahs’ hierarchy. Raisi is a close confidant of the Supreme Leader Ali Khamenei. Currently Raisi is the custodian of Astan Quds Razavi, the wealthiest charity foundation in charge of Iran’s holiest shrine in Mashhad, northeastern Iran, with close ties to Khamenei’s powerhouse. He ran for presidential office last year and lost to Rouhani. Khomeini hand wrote a fatwa, a religious decree, authorizing the Commission’s task. In the summer of 1988, the Commission handed down 30,000 death sentences. The kangaroo courts hardly lasted more than three minutes on average. Some of the political prisoners who miraculously survived the slaughter have written or spoken of their ordeals. A simple question was asked by the judges: Do you still believe in Mojahedin? And depending on the answer, one could end up before a hangman. The gruesome accounts of survivors, especially female prisoners, often leave the listeners in shock. An audio tape was leaked out by Ayatollah Hossein-Ali Montazeri’s son in August 2016. Montazeri, the handpicked successor of Khomeini, was sacked for his public objections to mass executions in 1988. He spent the rest of his life under house arrest and died in 2009. In another part of the tape, Montazeri says that exterminating MEK members had become an obsession of Ahmad Khomeini’s long before the 1988 massacre. Montazeri in his tap quotes Ahmad as saying “All of them must be killed even a distant sympathizer who just reads their paper.” Considering Ahmad’s position as Khomeini’s right had man wiping out MEK members had been a strategic plan for the regime. Alireza Avaie was appointed Justice Minister in Rouhai’s second cabinet. He is as guilty as his predecessor. Avaie’s personal record in participating in human rights violations goes a long way back when he was partner in crime with the likes of Raisi. He was also a member of Death Commission in southwestern Iran. 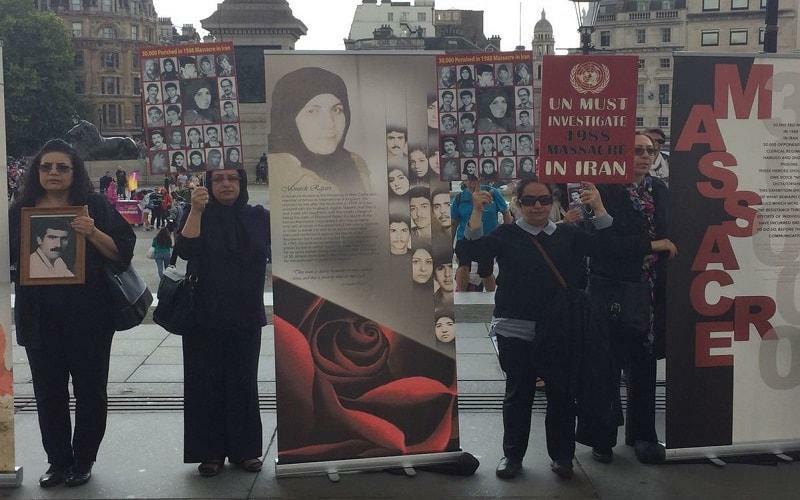 The National Council of Resistance (NCRI) set into motion a galvanized campaign to call for justice for 1988 massacre in 2016. Tahar Boumedra a former UN Human Rights official and legal expert took the lead on behalf of families of 1988 political massacre. The Iranian regime’s cruelty goes far beyond the victims and it hits immediate family members and even distant relatives. Iranian regime for years tried unsuccessfully to put a lid on its heinous crime. Families of the victims are still in dark as to what really happen to their children on that fateful summer. Some are searching for signs of their loved ones and often traveled in far corners of the country hopping for a single clue. Getting rid of any evidence that might implicate the perpetrators of the crime has been a strict policy of the regime. The bodies of the executed prisoners were not allowed to be buried in public cemeteries. They were buried in mass graves usually far from the cities hoping that the families would not find them. Razing the unmarked mass graves according to the Amnesty International is tantamount to psychological torturefor the families of the victims. One can image a mother, wife or sister that gotten use to weekly visits of an unmarked grave site which she is not even sure that it is his son, husband or brother and one day finds out a highway soon will be built on top of it. In the case of grave site in Ahwaz that is what happed. On September 26th 2017, The former UN Special Rapporteur on the human rights situation in Iran Asma Jahangir ,refers to widespread executions inside the Iranian regime prisons in 1988, reminding, “The family of those who were executed have the right to know and be informed on what happened in 1988”. The Iranian regime and its leaders should not be allowed to escape the consequences of their crimes against humanity. Bringing them to justice will set an example that the world is watching. An independent international commission investigating the crimes of 1988 in Iran is the first positive step.